In low light situations, I wanted the ship sharp in the foreground, and nearby water showing motion blur. I also wanted features on the horizon to be sharp (with no motion blur). Choose an aperture that gives you the depth of field you want (e.g. sharp focus from foreground to horizon). My Olympus 12-100 f/4 lens is sharp and has sufficient depth of field used wide open. Choose an ISO value that results in the shutter speed you want (between 1/2 and 2 seconds). With my micro 4/3 cameras, I’m conservative with ISO, but I’ll use up to 3200 if pressed – even for landscape shots. Use your camera’s built-in image stabilization (or mount your camera on a tripod) to stabilize it on the ship. Since my setup has the Olympus dual-IS capability, I didn’t use a tripod. Instead, I braced myself against the ship and hand-held these. Make several exposures and check for sharpness. Since the ship is moving relative to the horizon, this setup is different from a normal dry-land photo. To keep the horizon sharp, you’ll have to either time the ship’s motion and expose when it’s minimized (difficult), or make multiple frames and pick ones where the horizon features are sharp (easier). I was able to get sharp images with exposures as long as 2 seconds, but I made multiple frames for insurance. So that’s it. A fun technique that will give you some nice “cruisey” images. If you try this, let me know how it works for you. I’d change this slightly from”instead of” to “instead of or in addition to”, but that’s a small quibble. Moore’s law keeps driving the computing capabilities in phones and cameras ever higher and it’s fascinating to see what companies do with the extra potential. Until iOS 11 added this feature, I wasn’t too interested in Live Photos. Now, I’m watching for places to use it. You can get a better image with your high-end camera and traditional optical techniques, but this is easier and a lot of fun to play with. Pick a suitable subject: moving water, traffic on a road, blurring people in a crowd, etc. Motion blur with a traditional optical approach requires a slow shutter speed – either low light or using filters. Since computational methods works by processing multiple frames, you can use it in bright light without filters. Apple says it works on their newer phones (6+ and later). You’ll need to have iOS 11 (or later) installed. The Long Exposure effect has to align Individual frames and then crop where there’s no overlap so you’ll lose pixels around the edges. Ideally, use a tripod – but that sort of defeats the idea of pulling your phone out of your pocket, doesn’t it? Just hold the phone as steady as you can to minimize cropping. Make several exposures and pick the best one later. Long Exposure resolution seems to be lower than default iPhone photos. This isn’t a huge problem for the moving parts of the frame – they’re supposed to be blurry. For the static portions, you can load both versions into layers in Photoshop and use masking to paint in higher resolution where you want it. I did this for the first photo above. You can set a Long Exposure photo as your wallpaper. You’ll see the static Long Exposure version until you press on it from the lock screen. Then it changes to show the three-second animation – cool! I hope Apple enhances this in future updates. It’d be good to have some control over the blur effect. 3 seconds is nice, but some subjects will look better with less (or more?). iOS 11 includes other updated computation photo capabilities (e.g. portrait lighting) – but that’s a subject for another day. Photography’s changing fast – it’s a wonderful time to be a photographer, isn’t it? In today’s digital world, many advances are likely to be computational and not optical. Keep up – don’t be left behind! Thanks for stopping by and reading my blog. Now – go compute some photos! Kevin M. and I went to Viera Wetlands (Ritch Grissom Memorial Wetlands) last weekend. On the way, we stopped by Riverfront Park in Cocoa for a sunrise photo. Unfortunately, the sun didn’t cooperate – we didn’t even see it until about a half hour after sunrise! But I thought the fog, boats, and lights were photogenic. The water was very calm – leading to great reflections and very little motion blur even though this is a 13 second exposure due to the dim light. There were many warblers (mostly Palm Warblers) and Tree Swallows. And just so you know, I think Tree Swallows are one of the hardest birds to photograph. I hardly ever see them sitting still. And they’re so small and fast that photographing them in flight is a very low percentage shot – at least with my equipment. I’ll get a good photo of one someday. Of course, we also saw many of the usual wading birds and the gators seemed more numerous than normal. I also got to meet one of my Flickr friends (New NewEnglander) who was visiting from up north. We also drove through the Click Ponds and saw huge numbers of ducks (mostly Green and Blue Winged Teals) and shorebirds, and then headed down the dirt road toward Moccasin Island tract. I’ve been down there a few times before without seeing much. But this time was very interesting and proves that you need to visit someplace over and over to fully appreciate it. We saw what we think was a Merlin fly by, but weren’t quick enough to photograph it. We also spotted several American Kestrels – the first time I’ve seen them in the wild and a real highlight of the trip. We saw one of the Kestrels engaged with another similar sized bird, but were too far away to make out what going on. It looked like they were actually grappling with each other. Both birds flew away before we got close. Other birds on the road included Sand Hill Cranes and Eastern Phoebes. A wonderful morning out in natural Florida. You can read much more about Viera Wetlands in this blog category and Cocoa posts are in this one. I have more Viera photos in this set on Flickr and more Cocoa photos in this set. ©2014, Ed Rosack. All rights reserved. For some reason, I’d never noticed Hillsborough River State Park until fellow Photography Interest Group member JT Smith asked me about it – thanks JT! There are a lot of photos of the park on Flickr, many of them quite nice. So I decided to go over on a scouting trip. Flickr’s a great place to research new locations and I spent a while going through their search results as well as Google maps before my trip. Dark river in the deep woods. A Hoya 8 2/3 stop neutral density filter let me stretch my exposure time to 25 seconds at f/8 and ISO 100 to smooth the water surface. The park is about 20 miles north-east of Tampa and an hour and 40 minutes west of where I live. Not too long a trip. With all the rain we’ve had recently, added water’s made the current look pretty fast through the rapids. My kayak would get a few scrapes paddling through this. Hillsborough River rapids. I’m a sucker for Cypress Knees and it was a treat to find some by the rapids to use as foreground. Since the wind was blowing a bit, I made two exposures. A slow one (30 seconds with the ND filter), and another not so slow one (no filter, 1/13th second). To eliminate the blurred leaves, I combined them in Photoshop using layers and masking the first for the water and second for the foliage. Hillsborough River. This is an Infrared, false color, three exposure panorama. This place is near the kayak put-in. I’m going to make a return trip and bring my kayak. I think I’ll paddle the parts in the first and third photos and not the second. And if you know of a good photo photo-op in Central Florida – please let me know. I love to explore new places. Lynn was out-of-town last week at the Pressing Iron & Trivet Collectors of America Convention in Indianapolis, Indiana. I talked her into letting me out of my spousal support services subcontract, so I had a chance to sneak in a few days of photography while she was away. I spent the time in St. Augustine, Florida, which is “the oldest continuously occupied European-established settlement and port in the continental United States”. I’ve written about it many times (see this link) and it’s one of my favorite places to photograph. Photo ops abound and include landscapes, architecture, street scenes, beaches, historic landmarks, wildlife, and much more. It’s hard to go anywhere in the area and not come back with a photo! Here are some of mine along with hints on how I made them. There are some wonderful sunrise and sunset spots. Friends told me about Marineland Beach (thanks Kevin M. and JT) which is just a little south of St. Augustine. It’s now one of my new favorites. The coquina rocks there worked really well as foreground objects in my photos. This is a single exposure, made through a Hoya ND400 filter right after sunrise. The waves were coming in around me, but I stood my tripod on one of the rocks to keep us dry. I used my lowest ISO setting (50) and even with the sun in the frame, the 8 2/3 stop ND filter gave me a 14 second exposure at f/8 . The long shutter speed makes the water surface contrast nicely with the rock texture. One thing you’ll run into in Florida on summer mornings is condensation. It’s so humid that if you take your camera gear directly from your air-conditioned room or car out into the moist air, you can expect 15 to 30 minutes of fog before they clear. You can decrease this by not running your car’s AC on the way. You can also seal your camera and lens in a plastic bag with as much air removed as possible until it warms up. And it’s a good idea to bring along a micro-fiber cloth to remove condensation if needed. The larger your camera / lens is, the longer it will take to warm up. This is one time that good glass works against you – at least until the temperature equalizes. One more point: try not to change lenses under these conditions. If water condenses on your sensor, it can be hard to remove and may cause dust to adhere to the surface. The harbor and fort (Castillo de San Marcos) also provide interesting detail for sunrise or sunset and landscapes in general. A calm morning in the St. Augustine harbor: Clouds to the north over the Castillo de San Marcos and the quarter Moon above the Bridge of Lions add interesting detail to this image. This photo and the next were both multi-shot panoramas made with the techniques I described last week. Images like the harbor scene can be tough to blend due to smooth gradients in the sky and water. Be sure you check carefully and correct any glitches. Another thing about summer in Florida: We have awesome afternoon thunderstorms. Clouds add a lot of drama to photos, but the storms were so bad on two of the days I was there that I couldn’t go out for sunset. Plan accordingly. On this evening at the fort, there was a large thunder-storm to the west. The sky wasn’t colorful at all until the sun moved down below the thunder head, resulting in these shadows and rays. One big advantage of sunset photography vs. sunrise is that you can wait to see what develops. At sunrise, you need to be in place extremely early to see all the variations happen. I had a great time walking around the fort at sunset with my large tripod and big DSLR camera. Most people were oblivious and walked right through my photos (I don’t blame them – I don’t own the place). I’d wait for a clear spot in the traffic and make another exposure. Other folks stood next to me since they thought wherever someone with a big camera is has to be a good spot. At one point, a tour guide in a pirate costume leading a group of 20 or so people saw me and stopped his group from walking in front of me until I finished my exposure. It turned out he’s a photographer too. I wanted to try a night photo of the lighthouse. I also wanted to capture the look of the beam coming out of the light. This turned out to be a tough assignment. The contrast range is huge and there’s a lot of glare from the lights in the scene. I ended up merging two exposures. The first one was long (f/4 @ 3 seconds) at a low ISO (400) to decrease noise. The slow shutter blurred the light beam, so I made a second exposure (ISO 3200, f/4 @ 0.4 seconds) and this stopped the beam enough to highlight it. The second exposure had some noise, but was fine with a bit of post processing before I blended the two manually in Photoshop. I made this photo about an hour before sunrise. It was dark and there was no one around. One of my contacts on Flickr commented that spooky things happen in this area. I’m glad I didn’t notice any when I was there. Tom M. met me up there on one of the days and we spent several hours just walking around. There were many interesting scenes, and I never saw any two doors alike. We were walking down one street and saw someone in the distance photographing this house with his iPhone. He was really working it, making multiple photos / compositions and was still there when we arrived several minutes later. We waited for him to finish and when he looked up and noticed us he asked what kind of cameras we had. It turned out he’s a photographer too and was there on vacation, but forgot his Nikon D3S DSLR. He said using the iPhone was “very liberating”. Photo hint 101: If someone’s taking a picture, look at what he’s photographing – it might be interesting. Photo hint 102: Don’t forget your camera. A little later, out of the corner of my eye, I saw this waiter zipping through traffic on the way to work. On a skate board. I managed to make a quick photo. We also noticed this person reading on the bench. I really liked the symmetry of the columns and how they led my eye towards the subject. Tom posted a different composition (sorry – no longer available) that I think is really good too. By the way, if you have Lightroom 5, try out the “Upright” settings in the Lens Corrections panel on photos like the one above. It does a great job squaring things up. Like I said, there’s a tremendous amount of photo-ops in the area. I didn’t make it by the St. Augustine Alligator Farm on this visit, but from March to June, it’s one of the best places in Florida to photograph a variety of wild birds nesting in the rookery there. I also didn’t get to Fort Matanzas. It’s a little south of the city and makes a nice side excursion. The Nombre de Dios Mission in the northern part of the city has a beautiful chapel and grounds as well as a view into the harbor. And I’m sure that there are a great many more photo ops that I still have to discover in this beautiful place. You can see these photos larger if you click on them and I have many others from St. Augustine in this set on Flickr. I went over to the coast yesterday with Kevin M., Kevin K., Lutfi E.
After sunrise we moved down A1A to explore Lori Wilson Park and the boardwalk there. It’s very nice and located right on the beach. Migratory birds have been reported there, but we didn’t find any on Saturday. Our last stop was Viera Wetlands. We wanted to check on it because we hadn’t been by since February. We saw a few of the common wading birds, some juvenile Anhingas, Ospreys, Coots, Glossy Ibis (that we hoped were White Faced Ibis – but weren’t), lots of Grackles, and a few other species. We also took a turn around the Click Ponds where we found a relatively uncommon Black Crowned Night Heron. Kevin M. managed a good photo when it came out of the reeds for a few seconds. This wasn’t our most productive or exciting trip ever, but we did have a good time. The activity was slow – I think we’re starting to get into the summer birding slow down here in Central Florida. We may need to look for a few different photo ops for the next few months. You can read other Central Florida Photo Ops blog posts about Viera Wetlands from this link. And I’ve collected other photos from there in this set on Flickr. 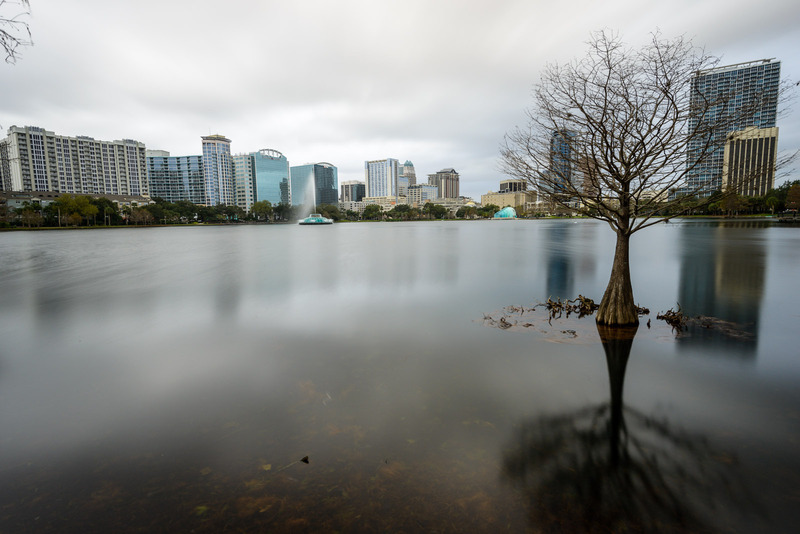 Lake Eola – Orlando, Florida. Long exposure, cloudy, sunset. You can click on this image to see a larger version on Flickr. f/8, 25 seconds; after initial adjustments in Lightroom. Here are the steps I went through to get to the final version: First, I corrected the distortion to make the buildings vertical in Lightroom. Then I edited it in Photoshop. I used content aware fill to finish the vertical distortion fix, then added a layer and masked out noise from darker areas. Finally, I ran the single image through Nik HDR Efex Pro 2 to enhance color, contrast and details. Back in Light room again, I finalized exposure, contrast and white balance and applied sharpening and a small amount of vignette. I like how it came out. For comparison purposes, here’s a 1/20 second exposure of the same scene. f/8, 1/20th second; Same initial adjustments as the version above. Looking at the long exposure version, the main differences I see are: the smooth sheen on the water surface, the much more prominent tree shadow in the lower right, and the radial motion blurring in the clouds. The tree shadow surprised me the most. In the short exposure version, the water ripples break up the shadow. They don’t in the long exposure version, which makes the shadow much more interesting. There are lot of upsides to long exposure photography and a few downsides. For instance, since the wind was blowing so hard on Friday, some of the smaller tree branches are a little blurry. Also, when you use very dense neutral density filters, your camera probably won’t auto expose or auto focus correctly, so you’ll have to take care of those things on your own. And some of these filters can also add a color cast to your photos, so you may need to be careful with your color balance. But all in all, it’s a great technique to have in your bag of tricks. Have you tried it yet? Why not? 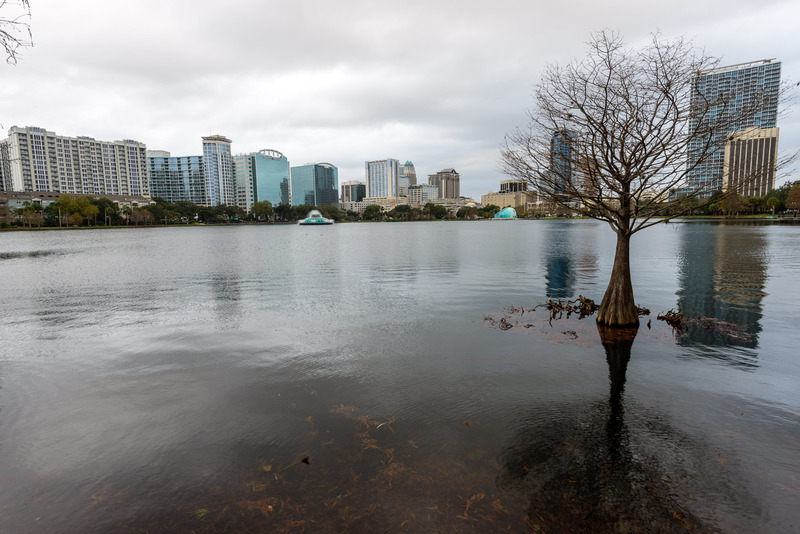 You can see more photos from Lake Eola in this set on Flickr.